In addition to his war photography, for which he is best known, over the last 60 years Don McCullin has been capturing images of England. This coming Monday (4 February), a TV programme about this aspect of his work airs on BBC 4 at 9:00 pm. There is also an exhibition of his photos at the Tate Britain from the 5th Feb (Tuesday ) to 6th May. Thanks for the heads-up on this Mike. Have programmed the Sky box to record it. Previous exhibitions I have seen of McCullin's work have mainly concentrated on his war photography. The last show at Tate Britain also featured some of his moody monochrome landscapes taken around where he lives in Somerset. This programme was something of an eye opener for me to see how he has been documenting other aspects of our country, concentrating on the social changes which have occurred during the past decades. What was really fascinating was to observe the empathetic manner in which he interacts with his subjects. It gave an insight into how he managed to get some of his astonishing wartime shots. The programme is available on iPlayer for the next four weeks using the link in my original post. It is definitely a worthwhile watch. Concerning the exhibition, so far I have only seen the review by The Times which awarded it a maximum five stars. I also caught mention of it on the BBC's lunchtime news yesterday. 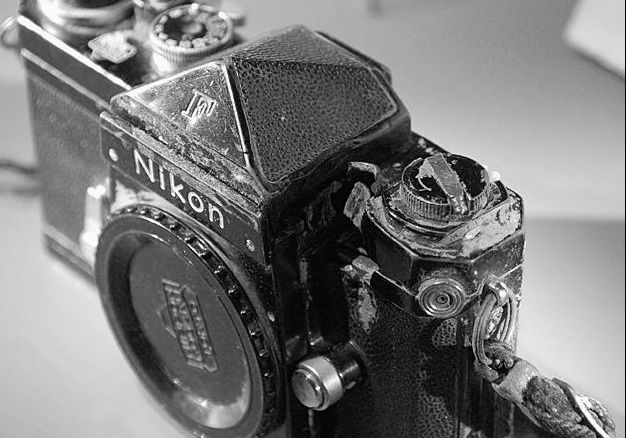 It looks as though it includes the Nikon camera which literally took a bullet for McCullin, saving his life, while he was photographing in Cambodia during 1970. I last saw it in an exhibition at the Imperial War Museum a few years ago and it is a remarkable artefact in its own right. Further to exhibition at the Tate Britain as mentioned by Wally. there is still time to watch the excellent documentary about Don McCullin on the BBC catch up service. Originally shown on Monday 4th February at 9pm on BBC 4. A brilliant photographer who deservedly (in my opinion) and not very well known, was knighted in 2017. I have watched this programme twice and can thoroughly recommend it.well worth viewing. Moderator's note: Moved from "Outings and Events" to General and merged with an earlier post on the same subject. waconquy wrote: There is also an exhibition of his photos at the Tate Britain from the 5th Feb (Tuesday ) to 6th May. I found this documentary about Don McCullin's photography on YouTube. It mainly covers his wartime experiences and does not make for easy viewing, but it does provide the background to many of the events he portrayed. In the film, McCullin also discusses his motivations. He says that he dislikes being known as a war photographer even though he was drawn to conflicts. He believed that he was helping to expose what was going on, accepting that in reality he probably made little difference to events. It is not surprising that he is still haunted by what he saw. For those who go to the exhibition, viewing the film first will aid understanding of the images from that period of his life. This week's edition of Amateur Photographer, on sale from today, has a lengthy article about Don McCullin. It features some of the shots from the exhibition and commentary from other photographers. I went to see the exhibition on Friday. I can highly recommend it, but it is certainly grim stuff and there is a lot to see - it will take 90mins to get around. He has photographed most of the major conflicts of the last 50 years. What amazed me from the TV documentary is that he seems such a down to earth guy despite everything, although from the quotes in the captions and the darkness of even his landscapes and still lifes, clearly the past has understandably left its mark. I will hope to go in the last week of April.